To help make sure your children develop good life-long oral health habits, it can really help to make oral health a fun and engaging experience for them starting at a young age. Building positive associations with taking care of their teeth and gums will mean that your children will be more likely to want to actively participate in their oral health. This is a great way to start them on the path to good oral health for life. Turn on one of your child’s favorite songs during teeth brushing time, and make it a challenge: keep brushing until the song is finished! Or, try playing one song for the top teeth, and a second one for the bottom; or, one for the fronts of the teeth, and another for the backs! The tooth fairy is the most common North American tradition surrounding children losing their baby teeth, and it can go a long way in getting kids interested and engaged in their oral health. The magic of discovering a little gift under your pillow in the morning, where you left your baby tooth the night before, is hard to beat. And it doesn’t have to be money! A small toy, a message from the tooth fairy, or even a brand new toothbrush can all be great choices, too. You may also want to do a bit of research; traditions for when children lose their baby teeth vary significantly from country to country and culture to culture, so maybe you’ll find something that fits your own family better than the tooth fairy. And you could also invent your very own, unique family tradition, too! Every time your child brushes and flosses, mark it off on a tally sheet or calendar. After a predetermined number of days or brushing/flossing sessions, have a special treat, a little celebration, or read a new book about oral health: there are lots of great books on this subject out there! Choose fun toothbrushes, floss, and toothpastes. Take your children along with you to the pharmacy, and let them pick out a toothbrush in their favorite colour, or one with a favorite cartoon character; they make all sorts of different, colourful toothbrushes for children. Toothpaste and even floss also come in lots of different flavours and in unique packaging, too. Letting your child pick these things out will give him/her a sense of agency and involvement when it comes to oral health. Make brushing and flossing a family event. Gather your whole family up in the bathroom every morning or every evening, and brush and floss together! It may be a bit crowded, but why not take a few extra minutes to spend some quality time? 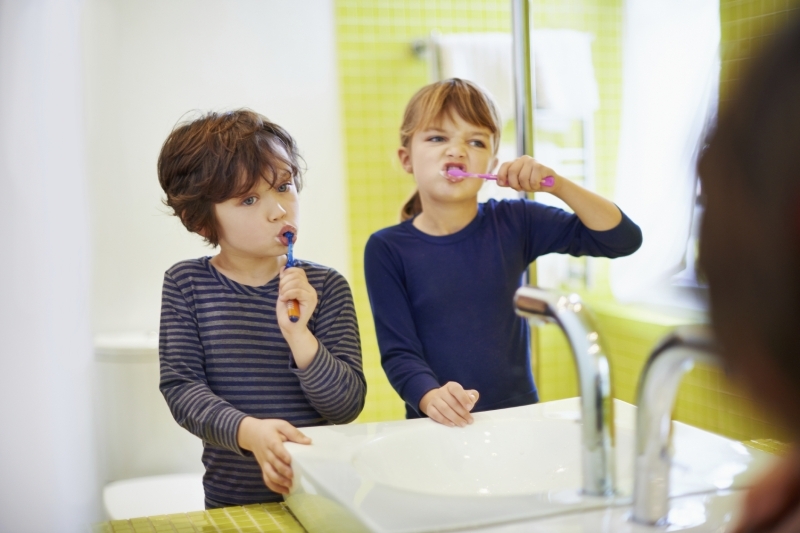 Chances are good that your kids will remember family teeth brushing sessions fondly as they get older! If you need more help making oral health a positive experience for your child, make an appointment with one of our dentists! Our office is specially designed to make the dental experience a happy, positive one for children.